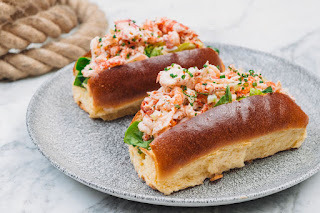 Crab and crustacean specialists CLAW are popping up for the whole of June at the 100 Wardour Street bar, restaurant & club in Soho. Open Monday to Saturday, CLAW has a space overlooking Wardour Street itself, and is offering items such as their Crab Roll for £9.50, and Lobster & Crayfish Roll for £14. Plus, lots of drinks to go with it, including champagne! "We are so excited to announce that CLAW are popping up at 100 Wardour St in celebration of D&D’s Spring campaign Blossom City for the month of June! We will be serving a selection of their delicious seafood rolls and sides accompanied by some thirst quenching cocktails and champagne with Moët & Chandon Imperial Ice for #BlossomCity17."